For "heavy-duty" applications, WIKA has developed a family of process thermometers which are notable for their innovative neck tube design with exchangeable measuring insert. 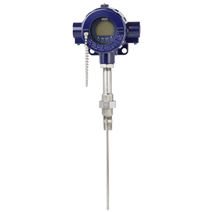 The TR12 resistance thermometer and the TC12 thermocouple are therefore particularly suitable for use in the process industry, in the chemical industry and in offshore applications. The centrically spring-loaded measuring insert and its extended spring travel enable combination with the widest range of connection head designs. A process transmitter can also be fitted without difficulty. For mounting into the process there is a wide selection of WIKA thermowells to choose from.